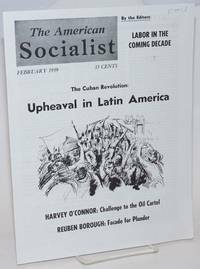 New York: American Socialist Publications, 1959. Magazine. 23p., staplebound magazine format, wraps worn, small stain on front wrap, else very good condition. 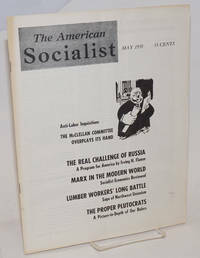 New York: American Socialist Publications, 1959. Magazine. 23p., staplebound magazine format, wraps worn, else very good condition. 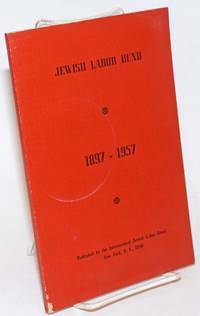 New York: Committee for Constitutional Government, Inc, 1944. 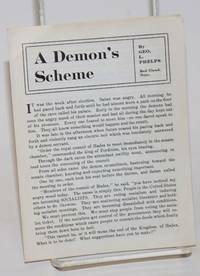 Six panel brochure, some ceasing and wear, 3.75x8.5 inches. 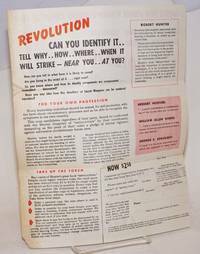 Promotes the sale of Robert Hunter's book on Revolution, first published in 1940. 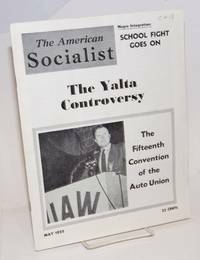 New York: American Socialist Publications, 1959. Magazine. 23p., staplebound magazine format, wraps worn and vertically creased, bottom corner of front wrap dog-eared, else very good condition. 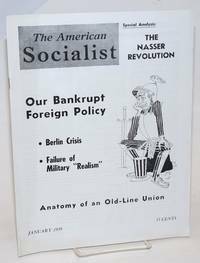 New York: American Socialist Publications, 1958. 23p., staplebound magazine format, wraps worn, soiled and toned, else good condition. New York: Fellowship Press, 1917. ix, 58 pages, staplebound pamphlet, very good. An early appearance by Thomas, then a Presbyterian minister, who worked on his first Socialist Party campaign in the same year, helping Morris Hillquit as he ran for mayor of New York. 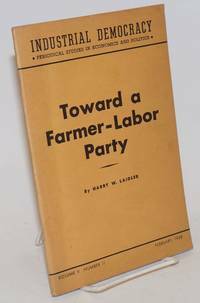 New York: Industrial Democracy, 1938. 56p., staplebound pamphlet, very good. Industrial Democracy, vol. 5, no. 11, February 1938. Boston: [the author], 1929. Hardcover. 95p., first edition, front., very good condition. "Christian socialism" *Sargent. Fuller was active in the Progressive Party and a supporter of Theodore Roosevelt. Joliet, Ill: P.H. Murray & Company, 1909. Hardcover. 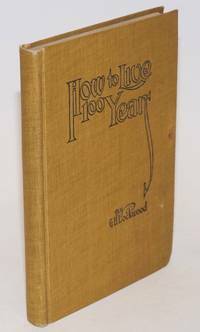 491p., front., illus., first edition, cloth binding edge worn and stained, minor internal staining else good condition. *Rideout novel. Hanna 468. 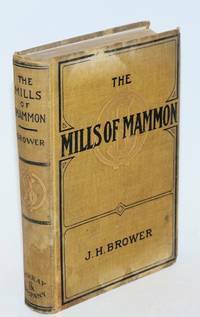 Socialist novel set in a foundry, involving clergymen, vice and prostitution. Burlington, CO: Record, 1916. Four panel brochure, 4.75x6.25 inches. Phelps was based in Red Cloud, Nebraska. A pro - Socialist Party fantasy, featuring Satan, on why you should vote for the Socialist Party candidates. Kalamazoo: Lockwood Publishing Co, 1912. Hardcover. 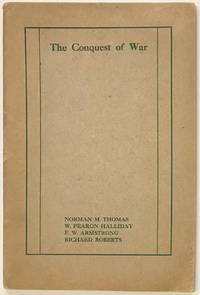 158p., illus., one corner bumped, small stain on front cover, previous owner's stamp and inscription on front blank pastedown else good condition Lockwood was editor of the socialist magazine Billy Goat. New York: American Socialist Publications, 1958. 23p., staplebound magazine format, wraps worn, horizontally creased, else good condition. 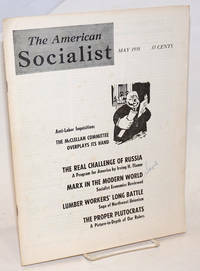 New York: American Socialist Publications, 1958. 23p., staplebound magazine format, wraps slightly worn and soiled, small stain on rear wrap, else very good. 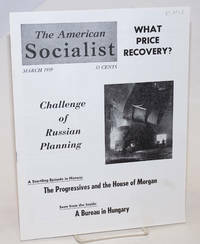 New York: American Socialist Publications, 1958. 23p., staplebound magazine format, wraps worn and foxed, pen notation on front wrap, else good condition. 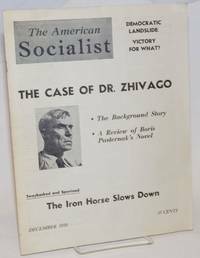 New York: American Socialist Publications, 1955. 31p., staplebound magazine format, wraps slightly worn and soiled, else very good condition. 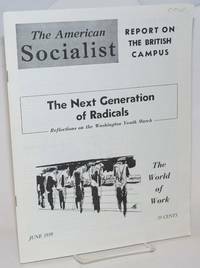 New York: American Socialist Publications, 1958. 23p., staplebound magazine format, wraps worn, horizontally creased, some foxing and rust stains from staples. 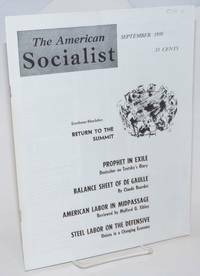 New York: American Socialist Publications, 1957. 23p., staplebound magazine format, very good condition. Stories on the Russian space program, Brazil, and more. 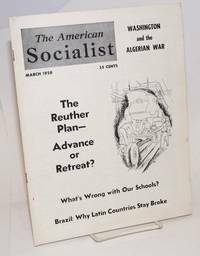 New York: American Socialist Publications, 1959. Magazine. 23p., staplebound magazine format, vertically creased, else very good condition. 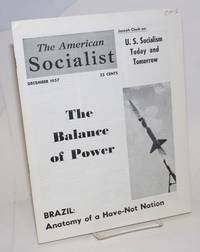 New York: American Socialist Publications, 1959. Magazine. 23p., staplebound magazine format, very good condition. Contributers include Bert Cochran, Harry Braverman, and Genora Dollinger.